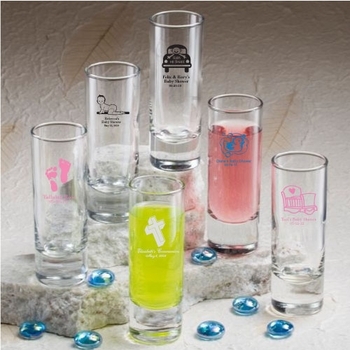 Personalized cordial glasses are a cheerful idea and a perfect party choice. With a myriad of screen printed design options available, you can create a truly unique keepsake to fill with sweet treats or your favorite beverage. Each glass measures 4 inches tall by 1 1/2 inches in diameter and has a 2 ounce capacity in the classic slender shooter glass shape and they are made in the USA. Minimum order is 40. Free shipping included.